Golf footwear worn on the course should either be recognised golf shoes or sports shoes. Sandals, jandals or other footwear is not acceptable. If Members or Guests are unsure then please seek clarification from the golf shop or Golf Committee. Golfers, caddies and supporters should be aware of the length of time they may be on the course and therefore: Be “Sun Smart” – Be prepared for adverse weather conditions. Clothing worn in the clubhouse should be neat and tidy and appropriate for the event. Footwear must be worn. Golf shoes are permitted in the Clubhouse. Hats/caps maybe worn in the clubhouse but not in the Eatery & Bar area. Procedure: Club officials have the responsibility to ensure the dress code is maintained. It is understood that acceptable dress can be a matter of opinion, but the overriding factor is that a neat and tidy casual standard is accepted. If unacceptable attire is determined, then a proactive approach is to be made to the individual/group to change or vacate the premises. After entering or playing from a bunker, a player should rake over all holes, club scrapes and footprints to leave the sand surface as they would like to play from it. The rake should be placed within the perimeter of the bunker away from where a ball is likely to enter, with the handle pointing toward the tee of the hole being played. Always try to enter the bunker at the lowest point nearest to your ball. Pull rake toward you as you enter the bunker. Rake properly any other affected areas. Do not pile sand at the edge of the bunker. Push back excess sand towards the centre and ensure it is smooth. After every stroke ensure you repair any damage you have made or see. Flagsticks, Bags etc. 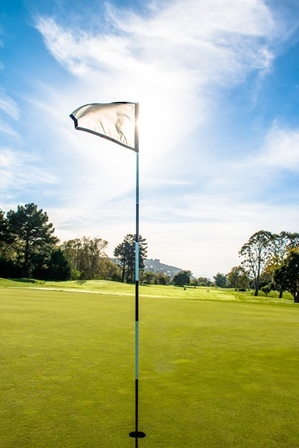 Players should ensure that, when putting down bags, or the flagstick, no damage is done to the putting green, and that neither they nor their caddies damage the hole by standing close to it in handling the flagstick or in removing the ball from the hole. 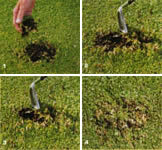 The flagstick should be properly replaced in the hole before the players leave the putting green.